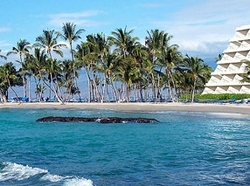 Relaxing Hawaii Babymoon Packages, Offering Plenty of Pampering in the Sun! Surrounded by lush gardens and open courtyards, Halekulani is a luxurious resort located on five oceanfront acres on Waikiki Beach. Halekulani, known for its unrivaled gracious hospitality, innovative guest service, authentic SpaHalekulani immersions and magnificently acclaimed cuisine is the perfect destination for your Hawaiian babymoon vacation. Mauna Lani Bay Hotel is a beach front resort and luxury hotel with award winning Hawaii golf and a spectacular resort spa. This tranquil oasis offers breathtaking views, green sea turtles, tropical fish, ancient fishponds and almost three miles of shoreline to explore. Rated one of the most romantic spots in Hawaii, Mauna Lani Resort is the perfect setting for your babymoon vacation. There is plenty to do here on your babymoon escape including golf, spa services, sunset cruises and fantastic dining. Don't forget to check out the extensive menu at the award-winning Mauna Lani Spa. Ho'oilo is Hawaiian for winter, and owners Amy and Dan chose to use the word as the name for their beautiful property, because it provides the perfect escape from cold winters elsewhere. Located in the West Maui mountains and offering stunning views of the Pacific, Ho'oilo House is just minutes from the Kaanapali resort area and town of Lahaina. The convenience of the location means you can spend your babymoon in either the tranquility of your accommodation, or you can choose to indulge in a little shopping and entertainment nearby. We recommend creating your own babymoon package, based around the 'Maui Romance' package, which includes a private dinner for two, prepared by one of the island's best private chefs. For the perfect pre-baby getaway, add a relaxing couple's spa treatment and your choice of the available 'welcome amenities', which include dark chocolate covered strawberries, a Hawaiian snack basket, a cheese and cracker plate, a fruit basket, flowers and sparkling cider. 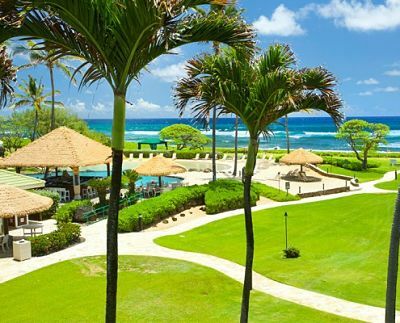 Aqua Kauai Beach Resort is centrally located near Lihue, on the eastern shores of the gorgeous Garden Isle. With convenient access to the entire island, this scenic property is just minutes from waterfalls, an ancient fishpond and the shops of the Coconut Coast. Or you may prefer to while away the hours on on one of the swimmable beaches, where you might be lucky enough to spot one of the abundant dolphins or turtles. The rooms at the Aqua Kauai Beach Resort are plush and comfortable, with air-conditioning, in-room amenities and stunning views. A complimentary shuttle to take you to and from the airport and to shopping centers! 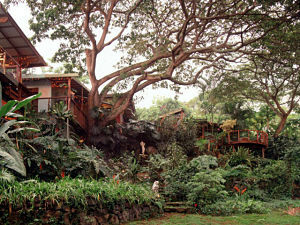 Dragonfly Ranch is a unique bed and breakfast destination on Hawaii's Kona Coast that describes itself as a "spiritually correct country club" and an "upscale SwissFamilyRobinson style getaway", catering to the gentle visitor seeking beauty, good health and fun. Some of the attractions at this romantic eco-spa treehouse include swimming with wild dolphins, yoga space, an organic garden, a restful hammock, flower essences and a sauna for the dad-to-be... but this spiritual retreat still offers more practical amenities too, including high speed wireless internet! Whilst the Dragonfly Ranch doesn't offer a traditional babymoon package, we think it's the perfect place to soothe body and soul as you await the arrival of your little one. With only 3 suites and 2 rooms - all with private entrances and private outdoor showers - it's an intimate location for your pre-baby getaway. To feel truly pampered, book a stay in the "Royally Sweet Suite" (also the Honeymoon Suite), where you are nestled in a jungle setting overlooking the ocean and are promised a blissful sleep on the king-size outdoor bed with memory foam mattress, screened in under a pavilion roof. 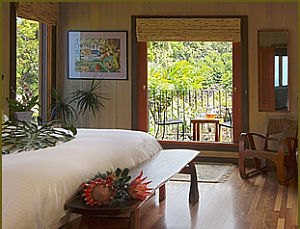 Holualoa Inn is set amid 30 acres of tropical fruit and flower gardens and over 5,100 Kona Coffee trees. At 1400 feet above sea level on the slopes of Mount Hualalai in the village of Holualoa, the inn offers stunning views of the Pacific Ocean and Kailua-Kona. This upscale resort features traditional plantation-style architecture, so it blends seamlessly with its surroundings. The interior takes you back to Old Hawaii, with its original eucalyptus flooring, Lauhala matting on the ceilings and traditional Polynesian furniture. This is a wonderfully tranquil location in which to celebrate your babymoon, simply soaking in your surroundings and easing the aches and pains of pregnancy by bathing in the stunning blue waters. The Inn offers 6 rooms, each with a comfortable sitting area, private bath and original artwork. To make your pre-baby vacation extra special, we recommend the "he aloha ho'oipoipo...love affair" extras package, which includes rose petals on the bed, chilled champagne (although you may prefer a non-alcoholic beverage), chocolates and fresh cut tropical flowers. For a truly intimate, peaceful and romantic babymoon vacation in Hawaii, look no further than Waimea Gardens. Situated in the foothills of the Kohala Mountains by a seasonal stream, this bed and breakfast resort has just 3 accommodation units - 2 cottages and a studio. Each offers a full kitchen or kitchenette stocked with breakfast provisions (including fresh eggs from the well behaved resident hens), wood floors, wifi and private bath, plus a private patio with a barbecue. Waimea Gardens' central location makes it an ideal spot for exploring the Big Island, with galleries and shopping just a couple of miles away and golf courses for the dad-to-be all along the Kohala Coast. You may prefer, however, to simply rest and enjoy the beauty of the expansive lawn, leading to the vistas of the Kohala Mountain foothills.